This report takes stock of the developments that have taken place in the arena of cluster development and suggest inputs to a policy framework for promotion of cluster based MSME development in India. The document draws heavily from a wealth of secondary literature and benefited immensely from the documents shared by several practitioners as well as insights obtained from a number of unpublished sources. Report was funded by Swiss Agency for Development and Cooperation. This document contains 69 simple questions in 18 short sections allowing the reader to sift through the type of questions of his/her interest as per the sections in the table of contents. The basic definition of cluster, its typology and spread has been captured. 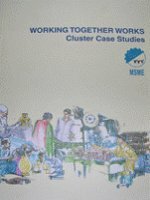 Issues of whether clusters should be newly created and aspects of how cluster policy is different from conventional enterprise development are also dealt with. Some of the terms like social capital, cluster mapping, cluster diagnosis, trust building, cluster action plan, networks and service providers which are commonly used in cluster development have been defined in the document. 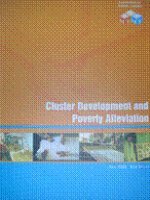 This book focuses on cluster development as a possible strategy to reduce poverty in India, where clusters already exist and poverty is widespread. “Policy interventions” to promote poverty reduction through cluster development has been clearly defined. Attempt has also been made to estimate the resource requirement to promote such clusters in India. 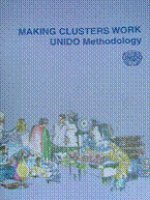 This book is a compilation of 19 case studies of cluster initiatives. It provides an insight into diverse cluster development approaches that can be undertaken with as much variety of objectives and outcomes. The idea is to capture the diversity of clusters, approaches,implementation agencies and objectives to help the reader draw one’s own lessons and conclusions. The case studies include a wide range of products among micro enterprises such as handlooms items, brass & bell metal, traditional footwear, crochet & lace work, coir products, hand tools etc. This document outlines the methodology of implementation of cluster development programme for improving the competitiveness of MSMEs. The document owes its origin and development to experiences gained in programme implementation in India and abroad, training programmes conducted nationally and internationally and literature review available on clusters.